My first time to Cameron was an experience I will never forget. If you are a Duke fan and have never attended a game here, I highly recommend it. Enjoy the story of my first visit to Cameron! It was a present to my boyfriend, Troy, for his 21st birthday. I had been trying to plan something awesome for his birthday several months before it came, in October. One day I just thought, "I'm going to get him tickets to a Duke game" (he's the only person I know who is a bigger fan than I am). So long story short, I buy tickets to Cameron, in the student section, and plan out how I'm going to give them to him. I took him to his favorite restaurant in Durham, and surprised him with the tickets after dinner. 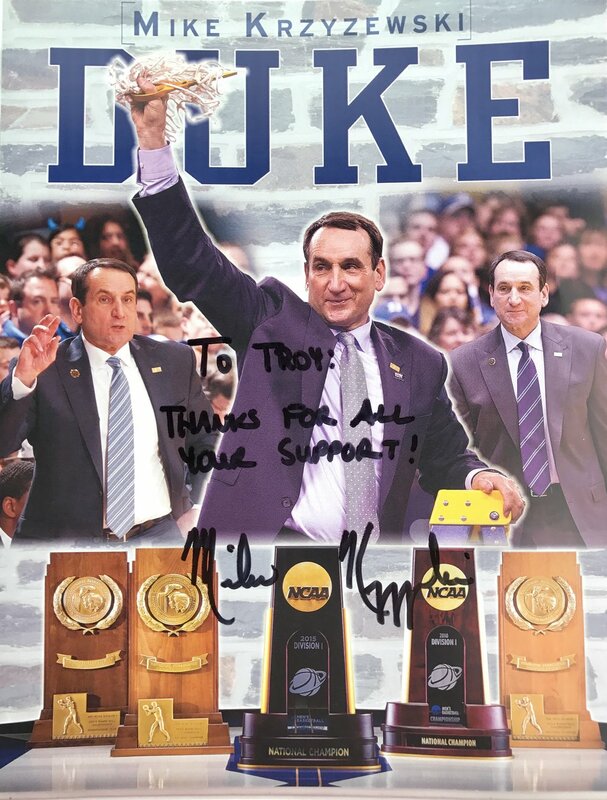 I also managed to get a personally signed picture of Coach K to throw in the mix (pictured below). I was so excited, I knew this would be such a big deal to him. Growing up being a die hard Duke fan, he had never been to Cameron, only away games. It was a first time experience for both of us. The day of the game we were so excited we could barely stand it. We have been to Duke a number of times to eat, attend football games, etc., but this time was different. We walked around the Duke basketball museum, (we were in college basketball heaven), played around with the awesome touch screens, took lots of pictures, and just soaked it all in. Finally, when the doors opened to our seats, we ran down the steps to the crazies section... it was even better then the pictures we always see. The players start coming in and warming up, the crowd is getting louder and louder, it was the season opener of the 2016-17 season. The crazies were telling us all the chants and when to say them. We were front and center and ready for the action. In the midst of all this, the possible Duke commit, Kevin Knox, was in the crowd visiting. We all were cheering his name as he walked in, in hopes to make his college decision a little easier. The game was definitely one to remember. While we were eager to see number one and two recruits play, Harry Giles and Jayson Tatum, these freshman were out for a period of time in the beginning of the season, due to knee and foot injuries. "The defense in this game really set the tone", player Grayson Allen claimed in his after game interview with Duke Blue Planet. Frank Jackson accounted for 12 of the 94 points, Luke Kennard with 9, Matt Jones with 7, Grayson Allen with 13 and so on. Overall I thought it was an amazing first game of the season. Watching them win was such an awesome feeling, and getting to high five the players hands at the end of the game was even better (I was totally fangirling SO hard). Perks of being front row after a win in Cameron. It was definitely something I will be doing again and again. I could only imagine what it is like after a Duke victory over rivals UNC. That is for sure a bucket list top five. I will forever cherish these memories, and I will always remember my first time to Cameron Indoor as one of the most fun nights in my college basketball fandom moments.